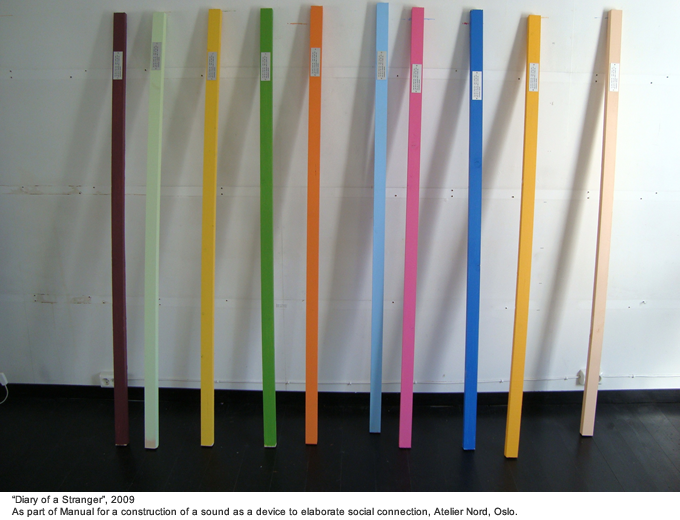 Sound art lives today a recognition in the art field, both in the art market and in the academic world. Nevertheless, the definition still lives a great dichotomy in its interpretation. On one hand, sound art is understood as an artist practice based on the medium of sound; on the other hand, it is configured more as a possibility of reciprocal listening articulated in different forms, in which sound can be silent. 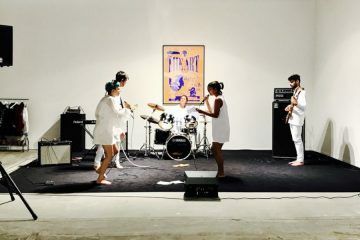 With his artistic and academic work, Brandon LaBelle proposes an inclusive definition of sound art, as a possibility of relation with the other, an ephemeral moment of encounter, as the potential of negotiation beyond or behind the voice. Becoming a stranger is an attempt to portray the complexity of Brandon LaBelle’s productions in relation with the question about what sound art could be, analysing two of his last artistic works, both interpreted as silent interventions such as Diary of a stranger and Counterparts; his last book “Diary of Egypyian” and the last micro-residency collective project on radical listening he organized last January at Errant Body in Berlin (http://www.errantbodies.org/), ,that works also as a publisher with a multi-disciplinary interest in sonic and spatial practices. Brandon LaBelle is an artist, writer and theorist mainly focused on sound art. His artistic work explores questions of social life and cultural narratives, using sound, performance, text and sited constructions. 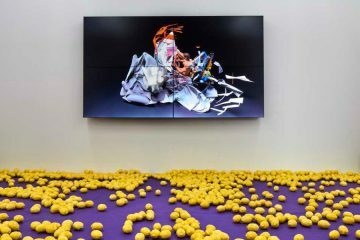 His artistic work has been presented at the Whitney Museum, NY (2012), Image Music Text, London (2011), Sonic Acts, Amsterdam (2010), A/V Festival, Newcastle (2008, 2010), Instal 10, Glasgow (2010), Museums Quartier/Tonspur, Vienna (2009), 7th Bienal do Mercosul, Porto Allegro (2009), Center for Cultural Decontamination, Belgrade (2009), Tuned City, Berlin (2008), Casa Vecina, Mexico City (2008), Fear of the Known, Cape Town (2008), Netherlands Media Art Institute, Amsterdam (2003, 2007), Ybakatu Gallery, Curitiba, Brazil (2003, 2006, 2009), Singuhr Gallery, Berlin (2004), and ICC, Tokyo (2000). 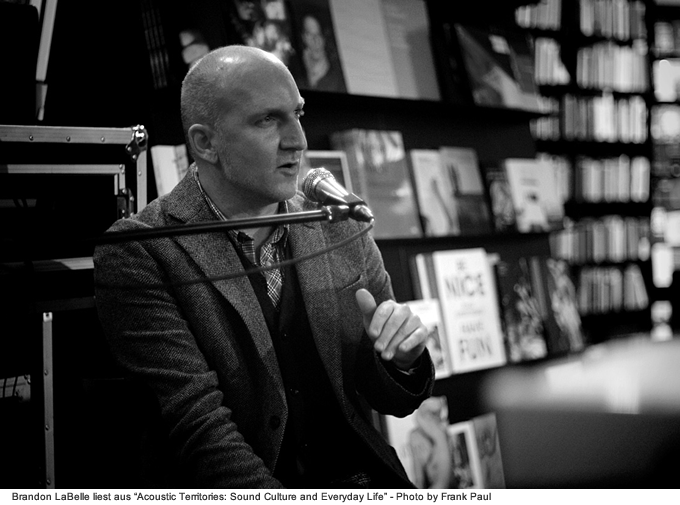 Also a prolific writer, he is the author of Diary of an Imaginary Egyptian (Errant Bodies, 2012), Acoustic Territories: Sound Culture and Everyday Life (Continuum, 2010), and Background Noise: Perspectives on Sound Art (Continuum, 2006). Silence is here the topic of the interview and the figure of the stranger, the metaphor of the artist’s poetic. Anna Raimondo: As an artist, writer, curator, critic, your research is mainly focused on sound art and its possible social and cultural implications. Referring to the quotation by Anna Fritz “Becoming is desire”, which desire(s) brought your attention to sound art? Brandon LaBelle: What led me to an interest in sound as an artistic project was certainly its relational potential – for me, sound is ungovenerable, that is, it is at one and the same moment, mine and not mine; it is exactly what may allow for expressions of sharing: it teaches us how to negotiate loss, and how to be extremely present. Sound for me is always more than I expect, and this I find very suggestive as an artist, and as a body. I’m interested in many of my projects to use sound as a vehicle for generating types of interaction, forms of narrative and knowledge production, that are often circulating around or base themselves upon the ephemeral, the transient, the migratory and the associative. Sound and listening are extremely related and generative of such experiences and ideas; they provide a platform for building out processes that question or unsettle the singular, the human-centric, the law and languages of the proper. In my projects I take this as a starting point, as a medium, to develop materials and presentations, site constructions and conversations; sound gives me the courage to trespass the limits of particular languages, and especially, my-self. Anna Raimondo: In your artistic and academic approach, it seems to me that you apply an “inclusive definition” of sound art. Not defined as “sound for sound’s sake”. In your opinion, what does sound art include and what could it be made of? Brandon LaBelle: You are absolutely right. I would say, a sound art is a form of “radical inclusion” because it also may include the excluded – not to speak in riddles! What I take from sound is an opportunity to embrace uncertainty, interruption, the invisible, languages that migrate, being-one-and-different, associative knowledge, shivers, noise, voices of strangers, the radio within, formlessness, the quiet, you, and certainly, the future. These are also of course the very things sound art could be made of. 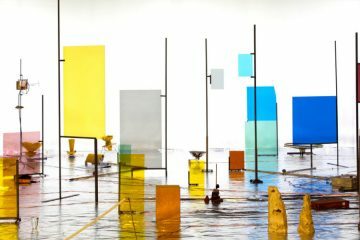 Anna Raimondo: Aesthetically speaking, in your opinion, does sound art require any visual component? Brandon LaBelle: I would never say it requires anything. Anna Raimondo: I am thinking of the relation between sound art and silence. Let’s focus on your work Diary of a Stranger [] It is a silent intervention in a public space in Oslo, in which you explore the social figure of the stranger. Participants carry one of ten wooden sticks painted in different colours, each with a metal plaque on carrying messages such as: “You don’t know me”, “I am lost in the city”, “take me with you”, etc. Those objects create a casual and participative cartography of the city, inviting people to circulate with the objects from one point of the city to another. In this case, silence and reading evoke the process of listening and the issue of strangeness between your invisible-silent voice and the one of the active spectator. Is this work a piece of sound art and if so, in which sense? Brandon LaBelle: I appreciate your reading of the work, and as you point out, its relation to “sound” is not direct. Instead, it occupies and creates a space of silent recognition and silent conversation. The object, this stick, for me is precisely a silence asking for attention. And this is a direction, a path (not the only one…) toward the stranger, or a becoming-stranger, a coming close to the stranger – a figure that has the possibility to shift the lines of social life, that has as its central potential an ability to unsettle the perimeters of the status quo, because the stranger in a way is never fully knowable; he or she (if we can say this…) is a type of circulation, a body without a proper name, a body that migrates; a body that hovers around, to occupy a zone always on the edge of the center; a body in the dark, or even, at times, in the light – a body that can also become suddenly very close. I would say: it is a poetic-body. These conditions and characteristics for me also suggest the characteristics of sound: is not sound always somehow a stranger? Even the most familiar sound – my own voice… your voice – often appears as if it came from nowhere; it escapes me. Becoming-stranger is a moment of encounter, a moment of sudden listening. 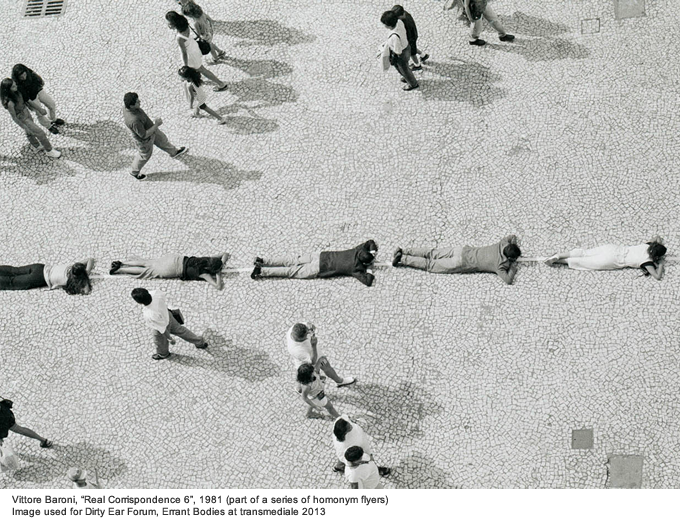 Anna Raimondo: The idea of a silent (thus made of sound) intervention in public space makes me think about another project, Calling Card (1986-1990)[] by Adrian Piper. In this piece, the Afro-American artist distributed written cards in public spaces with specific messages relating to concrete situations. Those cards, without providing any opportunity to verbally react to her, caused the reader to have an inner-silent-debate with himself about specific issues. We face here, again, what Salome Voegelin defines as “sonic silence” or “beginning of listening” (2010)[]. What place does listening play in your interpretation of sound art and in your work in particular? Brandon LaBelle: I think of the listener as someone who is curious but does not know; a body that is searching for what lies behind the scenes, that is suddenly touched by something – a voice, a fiction, a labyrinth to nowhere or to somewhere; I think of listening as a condition of finding association: every sound is already asking us to leave behind who we think we are. To say more about this: we have that feeling that sound comes at us; that it moves into our body, that it floods us. While this is true, I also tend to think that sound beckons us; it calls us toward it, and we move in its direction. It demands from us; it takes us toward a horizon of listening. In this way, sound is really a meeting point, a point toward which I move – yet where I will end up is never really knowable in advance; and further, this meeting point never belongs to me only. I like to think of it – this sound – as a space inhabited by a community of strangers. We meet here, as bodies associating, assembling – an assemblage…– and yet already on the way to something else, toward another listening. (But something can happen, along the way; this association does have consequence – sound changes me, this community can make something together). Anna Raimondo: I would like to come back to your piece Diary of a Stranger, which ended with a performance based on notes you made during the process. One of the sentences uttered was: “To share – to be”. I would like to connect this sentence to the spirit of your last book “Diary of an Imaginary Egyptian” in which you ask for an “agency of the intimate”, « outlining a tender map of the transnational » (from the presentation of the book on the web site)[]. Can we speak about your general work as a “poetic of strangeness”, as a condition of constant discovery, as a desire to engage toward the other from within the difference? Strangeness interpreted as a condition of constant discovery, as a desire to engage through difference, bringing with it a potential for intimacy. 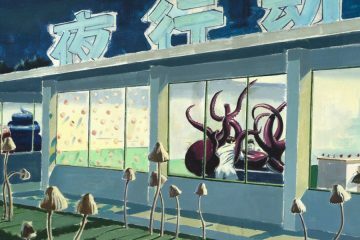 Brandon LaBelle: I find this very interesting, and very thoughtful; your perspective definitely resonates with me, and I appreciate this notion, of a “poetics of strangeness”. I think difference is about being recognized: there is always that idea that identity is formed only through separation (from the mother…), through a cut, a break (from wholeness…from attachment). To be “self” is to be a body set against a horizon; a figure against the background, outlined; it is to have a proper name, and to inhabit it, like no one else. Difference then is also the beginning of sharing; for it is what we give to the other – it is what we can offer, and it is also what we can receive: the difference of the other. Intimacy. Anna Raimondo: Does the fact that you are yourself a stranger in the place where you are based influence your artistic research and your political background? Does being a stranger allow you a more analytical perspective? Brandon LaBelle: I would say maybe something more personal here: being a stranger can also be about carrying a certain loneliness with you (I’m always thinking about writing a “history of loneliness”… what can we learn from loneliness, as a thread stretched throughout culture, the body, thinking, etc.? I think there is a great deal of loneliness at the core of all our endeavours…) – so maybe loneliness is the driving force, a backdrop to the necessity to “find the other”. Anna Raimondo: What is your relationship with American mainstream culture? And in particular, with your Los Angeles (sub)cultural background? Brandon LaBelle: It is in me like thirst. Anna Raimondo: Another interesting point of your work is the relation with the objects you transform. I am thinking now of your work Counterparts, that you realized in Curitiba (Brazil) in 2006 with Ken Ehrlich & Octavio Camargo. In this project [], the final object of the table built with the recollected wood synthetizes the whole process. In this case, do you agree with me that the table –the final result- is at the same time the documentation of the whole process? You often work with the ephemeral, with time-based or site-specific works: what is your relation to their documentation? Could it be considered a second artwork? Brandon LaBelle: I would say, yes, it’s interesting to think of the table as the documentation, embodying the process of the entire project. Its material body is the very thing that captures the intention, the imagination, and the development of the work. But the table also performed as an event – it stood at a particular location, and generated different interactions; people ate off the table; they talked across it, touched it and also, didn’t notice it. So the table was also a machine for producing conversation. Generally, I must say that I do not obsess over “documentation”: my focus is on the specific situation, and creating work to speak toward that situation. To document this will always be “less” than the situation; it is a trace, for sure, and in that way, I am ok to let it be a trace. I don’t need another artwork. Anna Raimondo: I have the feeling that anyway, and anyhow, your voice (your silent voice or your physical one) is always present in your work. And here I would like to mention Adriana Cavarero: “The voice manifests the unique being of each human being, and his of her spontaneous self-communication according to the rhythms of a sonorous relation” []. Would you like to comment on this quotation in relation to your artistic research? Brandon LaBelle: I certainly appreciate Cavarero’s thinking, and learn a lot from her writings, on voice and histories of Western logic. Her notion of the uniqueness of being is really quite beautiful (and brings to mind also the work of Walter Ong…) – at the same time, I miss something from her work as well. She tends to always move towards ideas of “communion”; that voice has a certain purity in establishing positive relations; that voice is the essential part of a human. While all this is very enriching and important, I’m also interested in voice as an aspect of argument, disagreement, lack – voice in other words as “negotiation”. In this way, the sonorous relation at the core of voice is also full of struggle, it is the place with which we don’t necessarily create agreements, but rather we deal with conflict. This doesn’t move completely away from ideas of “uniqueness”, but it does add another perspective to the voice, another tonality: that it is not always a given. Anna Raimondo: Sound is always inside and outside of the body. It is in between isolation and participation. Sound intimidates and requires intimacy. 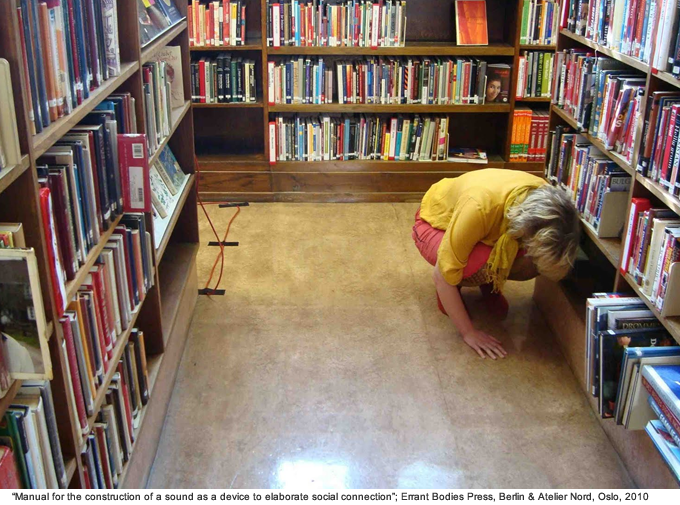 Starting from these points, in 2010 you edited with Errant Bodies the “Manual for the construction of a sound as a device to elaborate social connection” [], a reflection on a residency you and other artists had in Oslo in 2010. What were the main objectives of that project? Brandon LaBelle: The project aimed at exploring sound as public material. We brought together a small group of artists to develop new works specific to the city of Oslo. We functioned as a working group, expanding on different questions on public space and public life, while each of us worked on our individual projects. Topics such as collaboration, noise, politics of listening and public art generally circulated through the projects, and took shape through public events, interventions in the city, workshops and recording. We thought it important to create this process also as a way to invite public interaction and input. This we achieved by locating ourselves in a storefront in the city for the final period of the project. This space became a studio, a discussion and presentation space, a meeting point, and especially a space open toward the street. Anna Raimondo: Dirty Ear (January 2013), the last project you organised at Errant Bodies during Transmediale (http://www.transmediale.de/content/errant-bodies) is a continuation of the reflections that arose in “Manual for the construction of a sound as a device to elaborate social connection”. In both projects, it seems to me that the main questions are how sound can be a tool, a method, a device to engage political landscapes. In both projects, a collaborative space-time is being created between artists, using work-in-progress to build new knowledge. Can you tell us more if and how the last experience you had in Oslo guided you to the articulation of Dirty Ear? Brandon LaBelle: Certainly part of this work is really about developing strategies and methods of self-organizing, and of collective process, and over the years I’ve had the chance to experience this in different ways and in different locations. You might say this has become an educational experience on how to facilitate and direct informal collectivity and collaboration. This also appears in Errant Bodies, as a publishing platform, as well as Surface Tension, from which the Manual project grew (http://www.surface-tension-site.net/). 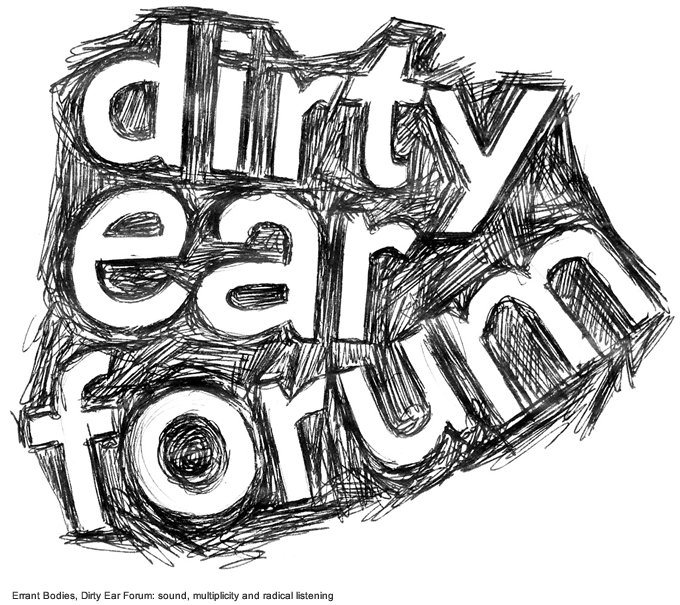 I’m not sure about any direct links between the Dirty Ear Forum and the Manual project, but of course there are resonances, in terms of their focus on sound, on questions of public space, or group work. In this way, listening can function as a platform for a type of social and political engagement. Anna Raimondo: Coming back to Dirty Ear, it was mainly a working-thinking space in which you invited another 7 artists to join you in a reflection on sound as a social tool. Can you describe how you structured the project and why? And how did you select the invited artists? Brandon LaBelle: I find it increasingly important to focus more on process, and to create platforms for types of experimental research, and this definitely requires discussion and exchange with others. The Dirty Ear Forum was an attempt to nurture such exchange, particularly on the question of sound and listening; I’d say it was about fostering and collecting a diversity of working methods and issues, and do so by structuring it around the notion of “multiplicity”, or ideas of “public-ness” – the “public” being an arena for diversity, interaction, processes of conversation: searching for commonality through difference. These then became also the themes for the Forum, and I thought of each participant as representing a certain perspective. To bring together a diverse group of practitioners whose work is also infected by discursive energy, by curiosity and inquisitiveness, and by an engagement with process. I didn’t want to get rid of these differences, but to amplify them in the work itself, in the sharing and occupying together a single space. Anna Raimondo: The project, in different phases, ended with a collective sound installation made of 8 speakers, one speaker for each artist. From a curatorial point of view, it was an interventionist, provisional setting. 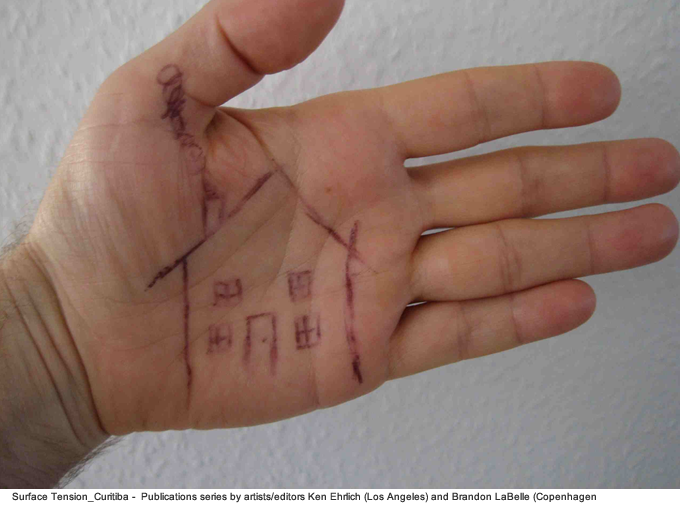 How does the curatorial approach reflect the relationship between multiplicity and isolation? Brandon LaBelle: I thought the idea of the 8 speakers occupying a single space would operate to generate a sense for individual work, for individual process, while also forcing this into a process of negotiation, of sharing and of working together. 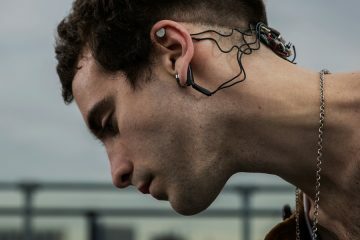 I always have this sense that sound is always crossing over between the private and the public – we might say, it shows us this as a dynamic event, as a channel for the relational; it reminds me that my body is not my own. 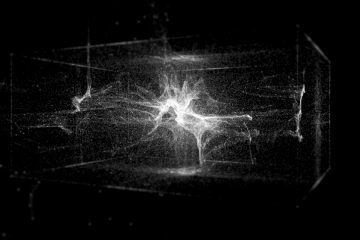 The structure of the Forum in a way was simply an analogy to this: that to make a sound is already to enter the public sphere, and so the question becomes, what can be made out of this collectivity? Anna Raimondo: In the text that accompanies the project you mention that Dirty Ear was also about “radical listening”. What do you mean by this definition? Is there a connection with political movements? Brandon LaBelle: I would not insist on any specific relation to political movements – part of the project was not to pre-determine a particular affiliation, a particular politics, other than a type of “anarchy”. But more, to insist on the potentiality of listening to act or contribute to today’s political environment, on a method of inclusion that also does not insist on cohesion. Anna Raimondo: What are the next steps of this project? Brandon LaBelle: I’m very interested in continuing this project by relocating it within different places and different contexts. I think what’s important is to continue – it’s clear that one of the most difficult things is how to sustain the conversation, how to extend the project so it might grow and in a way, realize some of its embedded complexity. There is always this great unfolding of energy at first, of perspectives, of sharing that goes with these projects, and that in itself is extremely enriching and significant. But I’m searching for what can happen once that energy is there, once we know each other: what can we do next. Anna Raimondo: Errant Bodies is a publisher based in Berlin, with a multi-disciplinary interest in sonic and spatial practices. How would you describe it? Brandon LaBelle: I think of Errant Bodies as a project of publishing in the expanded sense – of making public, which definitely includes a politics of association, a type of active poetics, which takes shape mainly through the book. The experience of the book is something I’m very interested in, and I find the book to be an extremely powerful tool, a powerful weapon, a powerful space of gathering, and for poetics – precisely what Edouard Glissant calls a “poetics of relation”. It is a public space, a shared space, of the page and its reverberations, into conversations and the civic. So, the book has a particular resonance that I do think offers an important opportunity for deepening reflection on society, as well as for leading the imagination. I like the slowness of the book, which in relation to the quickness of digital culture may offer a valuable counter-balance today. I’m also interested in how Errant Bodies can operate as a platform for collaboration, for extending the idea of “authorship” – this has been developing through different project series, for instance, the Setting for an Open Source series, which is staged as a performative installation where visitors contribute to a collective writing action. For me, the physical book, and the act of publishing, is also a perfect articulation of the union of the actual and the virtual (and always has been) – the book is already so palpable, and yet so immaterial; it invades this room with its silent energy, while remaining always already elsewhere; it is pure network, pure potentiality, whose materiality is both fixed and yet entirely open to sampling, referencing, reading. For a multiplicity of uses, and certainly, for types of action. For the last two years we’ve also had a project space in Berlin. While the publications function as platforms for collaboration, for sharing and disseminating, for developing conversations and extending work into the space of the book, the project space for me is important as a platform for more direct meeting. I see it as a way of supporting artists and the processes of research and experimental production, in sonic and spatial work, in text production and critical and poetical thought, and also, a way to invite the influence of these artists into the work we’re doing. So, the project space is about opening Errant Bodies up to others, to also contributing something to the city of Berlin, to act as a meeting point, and to extend Errant Bodies as a platform, and to be surprised by what may still happen. The project took shape in relation to the city of Curitiba’s recycling program, and specifically how this relates to “unofficial” waste collectors living in barrio communities and functioning within an informal economy. Researching this community and culture of trash and recycling the work functioned as an act of shadowing. This involved building a cart similar to those used by the “unofficial” collectors and circulating through the city to collect discarded wood. The cart was built in collaboration with a local craftsman and aimed to intervene within this circuit of trash collecting, which comes to normalize the cheap and partially forced labor of an impoverished community. 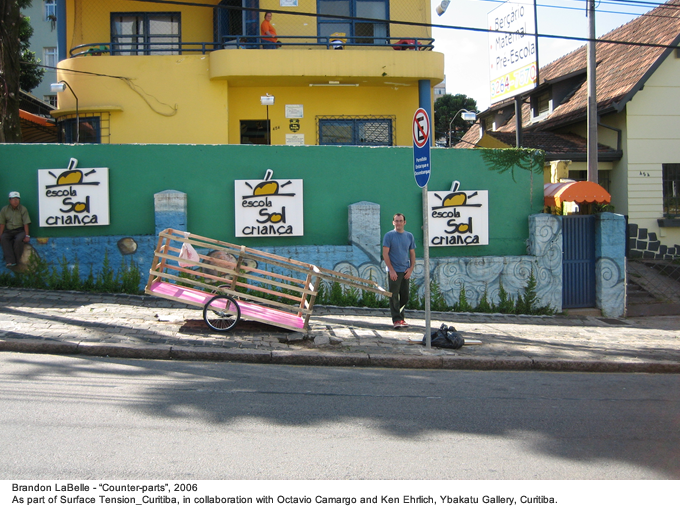 The cart functioned literally as a vehicle for creating interactions, and was finally exhibited at a local gallery space, along with additional works and artifacts, such as a table built from the collected wood and used for meals served during the exhibition. “Manual for the construction of a sound as a device to elaborate social connection”; Errant Bodies Press, Berlin & Atelier Nord, Oslo, 2010; 108 pages.